Established in 2004, Technosetbee is now a world leading supplier of high quality and cost effective beekeeping products. Based in Europe, the company owner is a very ingenious engineer and has kept bees for many years. He could see that the traditional materials used for beehives had serious limitations and the environment for the bees was not as healthy and hygienic as it could be. The Technoset Company was already an expert in producing top quality injection moulded components so it was a no-brainer to diversify into beehive components. A very comprehensive design program commenced to produce a complete beehive system, not just a few beehive components. Millions of euros were invested in tooling and the machinery that was required. Design patents were secured on the products and production has steadily increased ever since. They now export to many countries around the globe. They continue to work with beekeepers to ensure that all of the products provide practical solutions whilst improving the quality of life for both the bees and the beekeepers alike. New products are continually being developed. Here is one example. 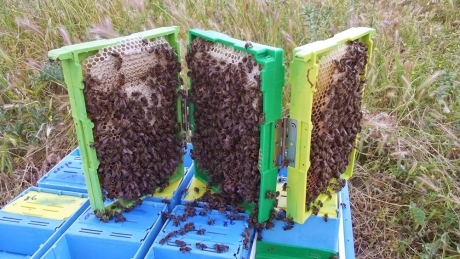 The Q8 Queen Mating Nuc. It has eight independent full depth compartments like the chamber below for mating queens. If you had a family with young children, needed a house, and had the choice of the following options, which would you choose? House one or house two? Polypropylene is the main component used for production of the Technosetbee products. It is a food grade material and is free of BPA (bisphenol A). The polypropylene is heavily fortified against UV radiation and has been used successfully outside for over 30 years. The Supers are double skinned and filled with 15mm Polystyrene for extra insulation. The polypropylene is between 3mm - 5mm thick and very strong. The Supers come as a one-piece item with no corner joins and are ready to use. All the Technosetbee products are designed to interconnect as a complete bee hive system. From entry guards to vertical queen excluders to pollen traps, the list goes on and on. Very strong and secure. 13mm dowels locate all the beehive sections so they cannot slide apart. 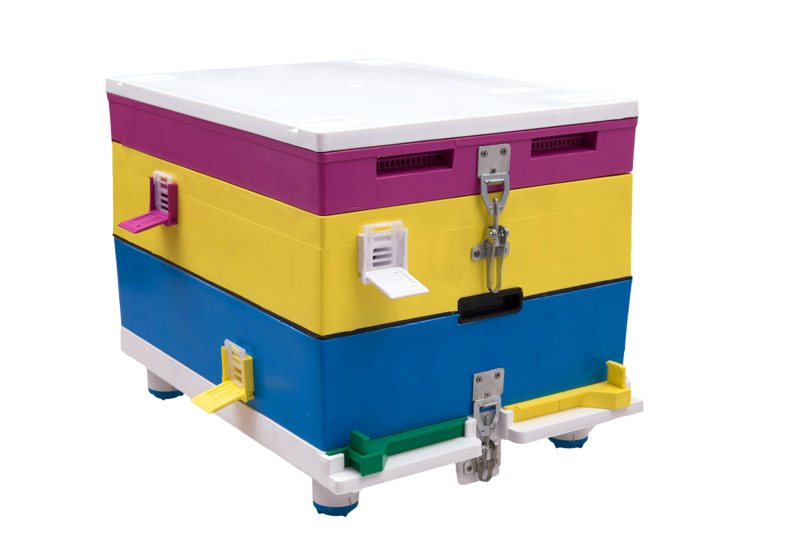 The optional latches can be used when shifting the hives or you can use the beehive straps that are commonly used in New Zealand. The excellent thermal performance of the Technosetbee system provides a healthy environment for honeybees all year round. It has much higher insulation properties than a standard wooden beehive giving the honeybees an environment more akin to living in a large hollow tree with a large thermal protective mass. Improved overwintering. The excellent thermal performance of the Technosetbee beehive provides a healthy environment for honeybees to survive cold and damp winters. Traditional wooden beehives are susceptible to condensation build-up and therefore expose honeybee colonies to diseases like Nosema. In contrast, the design of the Technosetbee beehive provides a dry and warm environment, increasing the survival rate and overall health of honeybee colonies. Faster Spring Build-up. 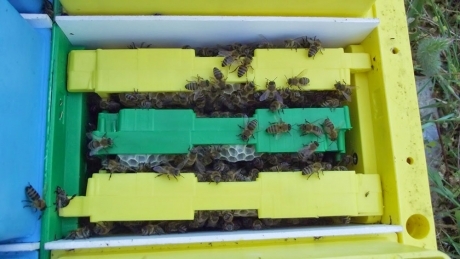 The additional warmth provided by the Technosetbee beehive encourages a faster build-up of new brood leading to a larger more productive workforce earlier in the season. Cooler Temperatures in Summer. Due to the insulated beehive properties, the internal beehive temperatures remain more consistent and the bees spend less time having to cool the hive. Fewer bees are also required to go and collect water and then return to “air condition” the hive by evaporating the water. Increased Honey Production. Reports from countries overseas show that the Technosetbee beehive consistently outperformed traditional wooden beehives. Technosetbee products are fully compatible with most wooden beehive products in New Zealand. You can start by using just a few products in conjunction with your wooden components. They have superior strength and a 30 year design life. Technosetbee products arrive on the freight truck ready to use. Save thousands on labour costs. No assembly, paint or preservatives are required. They won’t rot, warp or split. The Supers are available in attractive colour options of Blue, White, Yellow and Green. The bees use these colours as navigational identifiers and it prevents accidental drifting between bee hives. The roof and feeders incorporate air vents. Beehives produce heat which means that condensation can form in humid weather conditions. It is very important that the damp air can exit the bee hive. 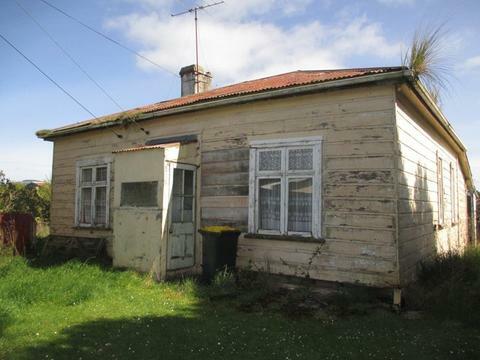 Varroa Optimised Design. The Technosetbee beehive uses a floor with a vented base. This makes the beehive less optimal for the Varroa Mite to survive and mites that drop to the bottom will fall through the grid and out of the beehive where they perish. Easy for beginners to use and an excellent investment for commercial beekeepers who enjoy efficiency and innovation. Fantastic value for money! If you divide the purchase price of Technosetbee products into the number of years of life expectancy, the price per year is typically far less than wooden components. And you can enjoy all the features, benefits and advantages of the Technosetbee system! Technosetbee Latch Kit with short levers.